Editor’s Note: Due to mechanical difficulties, the presentation has been cancelled at Village Pointe. But read this important information anyway. During years of working as his recording engineer, I watched Frank Zappa consume gallons of strong, black, Turkish coffee and incinerate thousands of Winston cigarettes. It wasn’t until after his death that I learned of Frank’s fondness for the fermented Korean relish, kimchi. An assistant to Dr. Wu, the renowned doctor of Oriental Medicine, told me Frank preferred a kimchi-laced diet when Dr. Wu was treating him for advanced prostate cancer. In my imagination, I could see FZ propped up in bed smoking a Winston, guzzling coffee and scarfing down kimchi. I miss that he’s not around. Kimchi is but one of hundreds of fermented foods that civilization has developed and used since the Neolithic Age. Fermented foods — ranging from pickles to sauerkraut, kimchi to yogurt, tempeh, soy sauce, wine, beer and more — are a culinary staple and were first developed as a means of preservation. In fact, the first sushi was fermented finger food served as box lunches at 17th century kabuki theatre. Recently, with the social trend toward healthful and sustainable cuisine, fermentation has enjoyed a renaissance of sorts in the USA. The only thing is, like canning, the art and skill of fermentation has been obscured in our fast-paced, fast food-oriented society. This generation’s mom’s aren’t teaching such skills and Home Ec classes have gone the way of Phys Ed. Add to that our social obsession with sanitizing and pasteurizing the life out of food for fear of liability suits, (somewhat justifiable, given the horrendous and unsanitary conditions most processed foods are spawned in,) and we find that fermentation is a lost art. Organizations such as the Weston A. Price Foundation do a good job of educating but there is nothing like watching someone do something in person to really get a grasp on how it’s done. That’s why demonstrations are so valuable. Luckily for those who are hip to the Village Pointe Farmers Market, such a demonstration will be on hand this Saturday, May 30, courtesy of Fermentation on Wheels. The peripatetic proselytizer. Artist and foodie Tara Whitsitt knows her way around the kitchen. And her kitchen knows its way around the country. According to Whitsitt’s Facebook page, her converted school bus has covered over 12,000 miles since 2013, as Tara stops here and there to hold workshops, lecture and give demonstrations about the wonderful world of living food that is the result of fermentation. Anyone who’s read Heartland Healing previously, knows about the billions of beasties that inhabit our gut. These life-enhancing bacteria, yeast and fungi provide us with an internal biome that is both healthful and essential to life. Fermented food is produced using some of the same families of microbes that flourish in our intestine. When we ingest properly prepared kimchi, kraut, kefir or kombucha, we’re re-upping on a vital nutrient base. Since commercially available “fermented” foods are pasteurized and devoid of life before hitting the grocery store shelf, in order to get the real benefits of fermented foods, a subculture of avid acolytes have jumped on the fermentation bus. Kool-Aid Acid Test As Ken Kesey said, “You’re either on the bus or off the bus.” (Too obscure for you? Visit a library.) 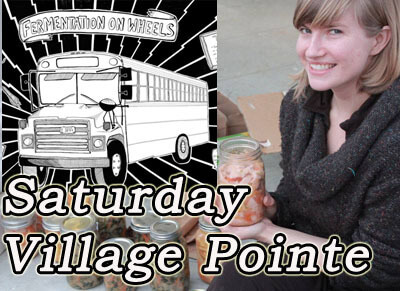 When Fermentation on Wheels and Tara Whitsitt visit VPFM on Saturday, visitors will have the opportunity to be “on the bus.” Tara promises to help the curious explore the Small, Small World of microbial life that lends itself to food in order to elevate it to a superfood, fermented and enhanced. Whitsitt’s project has been written up in the New York Times, featured on radio and television as she’s toured the country, supported in part by a corporate non-profit known as Fractured Atlas. She’ll instruct, sample, and even sell some of the all-important microbes (known as “starter”). Visitors will be able to learn a somewhat lost art, stroll a few feet to pick up some raw produce just perfect for heading home and growing your own. Living food. Processed food and the American diet in general avoid living food like the plague. I remember years ago getting criticized by some slack-jawed, mouth-breather for writing that carrots with the tops on them are a better choice than years’ old, bagged and barren carrots. That logic was shared with me by a chef friend who has gone on to international acclaim. The more life energy a food has, the more nutritious it can be. In the case of fermented foods, their very nature depends on the biochemical transformation imparted by the microbes that create the probiotic milieu. Thanks to the recent infatuation of the health-conscious set with yogurt, the idea of consuming microbes with our food is no longer considered “yucky.” Now, probiotics are a buzzword of the foodie movement. Sadly, many of the so-called probiotics available commercially are ineffective or weak sisters to the real deal. To get full benefit of the synergy created by the living food that is fermentation, the best way is to do it yourself. That’s going to be part of the fun of Whitsitt’s visit. Just don’t expect coffee or Winston’s with your kimchi.